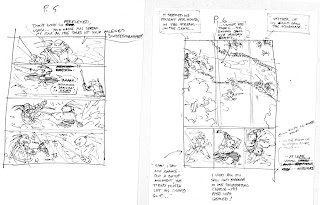 Peter Laird's TMNT blog: Blast from the Past #90 repost: roughs for Leonardo and Usagi story "The Crossing"
Considering this is also the 25th anniversary of Usagi Yojimbo, have you and Stan Sakai discussed doing any type of special joint project, even if it's just another crossover short? it'd be nice to See Pete illustrate the likes of the mighty Gen !! 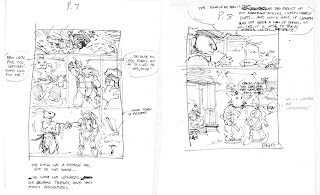 Considering this is also the 25th anniversary of Usagi Yojimbo, have you and Stan Sakai discussed doing any type of special joint project, even if it's just another crossover short?" One day, I hope Usagi will get his own series. He's a fun character. Although I don't think a fully anamorphised world of talking animals would fly these days. Unless Disney where behind it ;o)"
I'm not sure why you think it wouldn't fly. It seems to me that there is enough variety in animation today to allow something like UY to succeed. 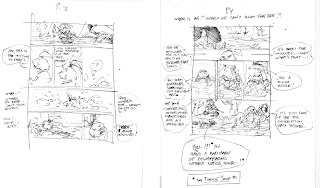 "BTW, any chance we can get some sneak peaks at designs from the new DTV movie? Speaking of new stuff? :)"
Actually, as much as I think it would be cool to see an UY TV series, I think it would be even cooler if UY could get a bigger-budget treatment in CG, as a movie. Speaking of bigger-budget CG movies, any news on the TMNT sequel, I noticed a blurb about the sequel on the aussie TMNT 25th anniversary site. If Budget concerns are holding up the talks, is it possible the sequel will go back to full CGI, which would seem to be a cheaper alternative to a hybrid movie. That's realy cool pete, And I'm glad your going to continue the BFTP articles for us. I would wager that fans, and especialy long time fans like myself, realy appreciate these behind the scenes articles. I actually finally purchased this piece for the first time for myself just a few weeks ago and I enjoyed it immensely. 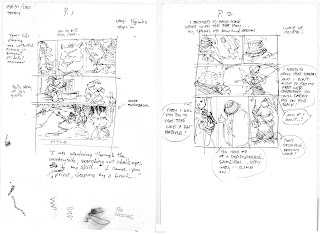 Your art was beautiful Peter and I love the way you draw Usagi. I am thrilled to hear about even the chance of any kind of collaboration with Stan. I have always though Leonardo and Usagi's personalities balanced one another well and wished they could have had more adventures together. Definitely one of my favorite aspect of the 4Kids cartoon. 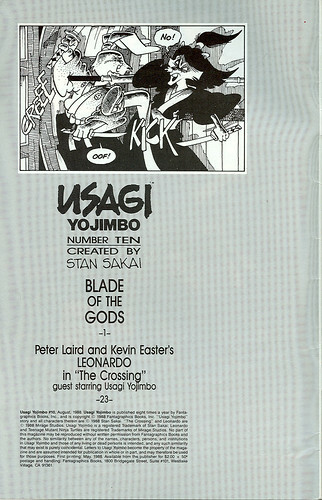 I would really, really like to see a few more TMNT/Usagi stories. Usagi said himself in this very story that he had "many adventures" with Leonardo... and they only actual adventures we saw was Shades of Green. NEW old stuff-- oxymoron alert! And yeah, considering both your comics are 25-- something should be done! OH, and that fan was wrong-- Usagi could be QUITE arrogant when he was a kid! "PETER LAIRD and KEVIN EASTER'S" LEONARDO - - ..
Online Betting Make money for you. Gclub Slot Is the leading online casino site, a fun online casino with hundreds of online gambling sites where you can enter and experience all kinds of online gambling and online gaming. Betting online is never ending. Because you can play online gambling anytime you want to visit our online casino site, there are enough staff to entertain you all the time. And if you are thinking of playing online gambling games, do not forget to choose the service with our online casino site because it is fun to play casino games online is another fun alternative to the player. everyone Anyone can join the fun and play online gambling games simultaneously.